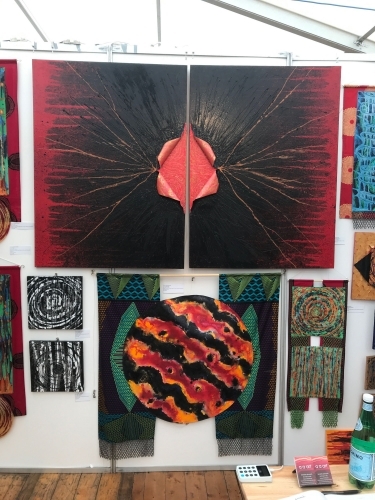 I recently participated in the Glasgow Contemporary Art Fair, which was held in a tented venue in the grounds of the Kelvingrove Art Gallery and Museum, 11th to 13th May 2018. It took many weeks of intense work, not only to prepare the artworks to display, but also ensuring that they all arrived in good order. Some I had to send via courier and as they were sent from Malawi, they had to be fumigated before being packaged at the couriers. I had to do the packaging myself, which took about 3 hours to complete! After sending to a friend in Fort William, I had a couple of weeks of worry as to whether they would be damaged or lost en-route. Everything was fine however, much to my relief. My other artworks travelled with me in a large suitcase and they were also fine on arrival. I initially travelled to Fort William, my home base in the UK, to stay with my friends and finalise the preparations for the Fair. To get my work from FW to Glasgow, I had to hire a van and deliver them to our storage unit 2 days before the Fair. I then travelled down myself by coach to stay in an Airbnb near to Kelvingrove. The Fair opened on the Friday evening, so Friday morning I had to get a taxi to the storage depot and then to Kelvingrove, to then spend a few hours (with the help of my daughter’s boyfriend) putting up my display. Exhausting work. Still, all was done in good time and the opening evening went very well. 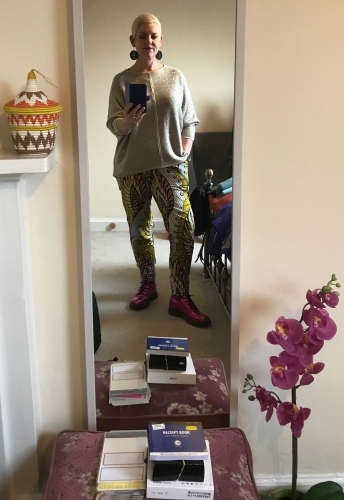 My outfit for the opening night – check out the boots! The Saturday and Sunday were fun, meeting folks and chatting to them about my work. I even managed one sale. Lots of interesting feedback, which has given me much food for thought. 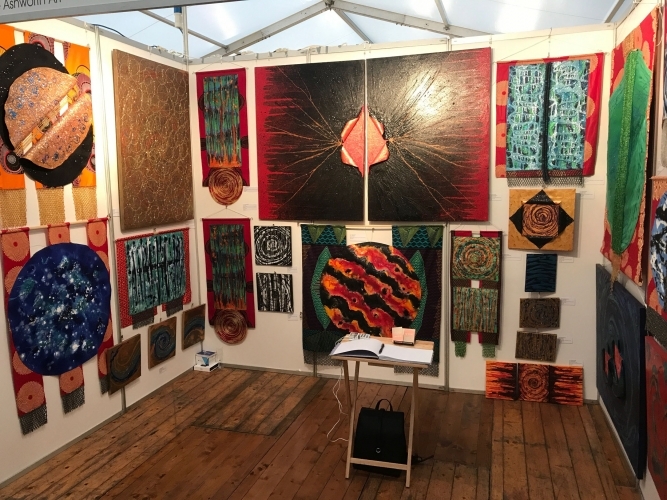 Will I apply to next year’s Fair, well, maybe….. it took a huge amount of effort to produce the work and attend, not to mention the cost and to only then have one sale was disappointing to be honest. However, I learnt a lot and meeting people I would not have met otherwise, was a delight.